Combine all ingredients in a blender and process until smooth. You can add ice if desired to make it thicker. I like to use a frozen banana. 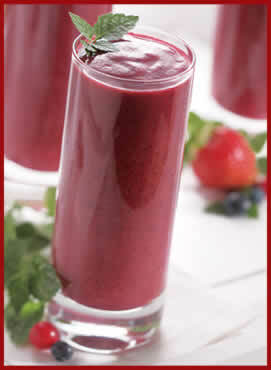 For a sweeter smoothie just use 1/4 cup (or more to taste) of the frozen Old Orchard 100% juice concentrate, any flavor. Without the banana or the extra sweetener, there are 177 calories per serving of 12 ounces. Makes 2 Servings. Enjoy!